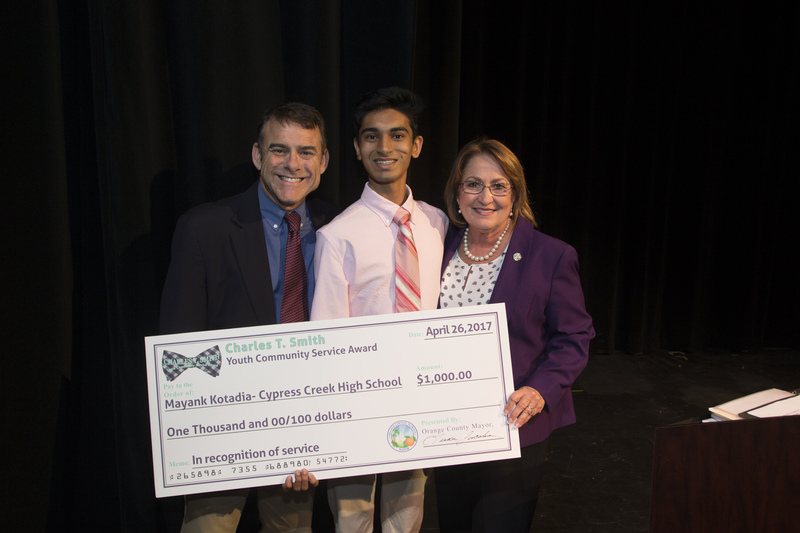 Orange County Mayor Teresa Jacobs recognized Cypress Creek High School senior Mayank Kotadia with the Charles T. Smith Community Service Award at the Cypress Creek High School Senior Awards Ceremony on April 26. Kotadia demonstrates a passion for community service and volunteerism through his work with the Boy Scouts of America Central Florida Council, and believes in helping his neighbors and the extended Orange County community. He truly believes that one person can make a difference in the lives of others and used this drive to create an Ecology Garden Bed near Southwest Middle School. Through the help of donations from the community and volunteers working on the project, Kotadia was able to transform a neglected and forgotten area into a flourishing garden of stromanthes and bromeliads. Mayor Jacobs met Smith during her campaign for Mayor and, in February 2011, extended an invitation for him to join her administration as an Aide for Constituent Relations and Outreach. He quickly learned the intricacies of a large government and, in August 2011, Mayor Jacobs appointed Smith as Orange County’s first Ombudsman. Smith was selected for this role because of his extensive understanding of County government divisions and his passion to serve the community. On August 28, 2013, Chase lost his battle to cancer. The Charles T. Smith Community Service Award was created to honor his memory and legacy. Featured Photo Caption: [L-R] Cypress Creek High School Principal John McHale, Charles T. Smith Youth Community Service Award recipient Mayank Kotadia and Orange County Mayor Teresa Jacobs honor Kotadia at the Cypress Creek High School Senior Awards Ceremony on April 26, 2017.